U.S. #548 pictures the Mayflower. 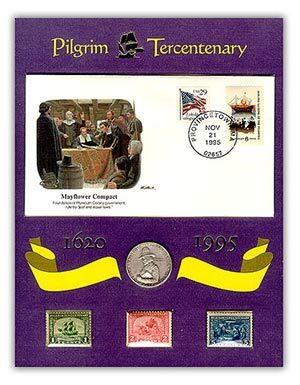 On December 21, 1920, the US Post Office Department issued a set of three stamps honoring the 300th anniversary of the landing of the Pilgrims at Plymouth, Massachusetts. The Pilgrims never intended to be wanderers. They were devout Christians who felt that only by a breaking of all ties with the Church of England could they retain their integrity before God. They went to Holland first, but their plight didn’t improve. So they set sail for America on September 16, 1620. Remember you can click on any of these images for more conditions and covers and to order them for your collection. U.S. #549 pictures the Landing of the Pilgrims. The Pilgrims first arrived in America on November 11, 1620. Before going ashore, 41 of the male passengers signed the Mayflower Compact, agreeing to follow the laws they would eventually set. They spent about a month collecting firewood and scouting for a place to build a settlement. Around December 10 they found a spot they liked and returned to the Mayflower. The Pilgrims then sailed the ship to Plymouth Harbor and came ashore on December 21. 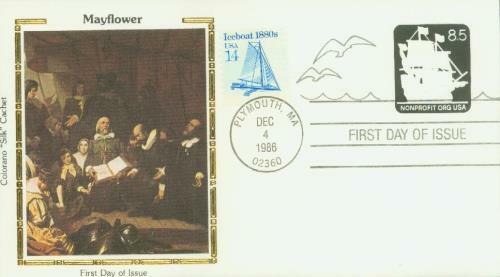 U.S. #550 pictures the signing of the Mayflower Compact. The Pilgrim Tercentenary stamps were issued on this same date in 1920. 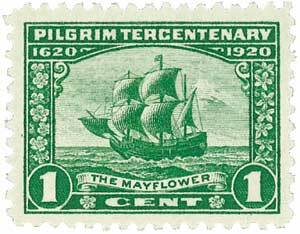 The first stamp in the set, the green one-cent “Mayflower,” honors the vessel that carried 102 brave travelers to the religious freedom America promised. Although the Pilgrims had a charter for Virginia, they landed in Massachusetts. U.S. #1420 was issued for the 350th anniversary of the Pilgrims’ landing. 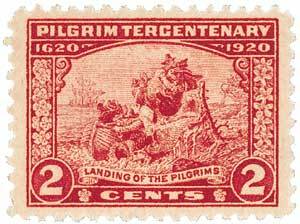 “Landing of the Pilgrims,” the two-cent carmine rose stamp, honors the voyagers who came ashore just before winter, too late to plant crops or build more than the simplest forms of shelter that first year. Many didn’t survive the winter. This settlement is where our Thanksgiving holiday started. Tradition says a grateful Pilgrim colony offered up thanks for several days after the first harvest was gathered. This issue shows the Pilgrims landing at Cape Cod, Massachusetts. Contrary to early public opinion, stamp experts believe today that this issue illustrates fine detail and required extreme skill from the engraver. In fact, had the cloud background been left out of the design, philatelists feel this issue might rank as one of the outstanding US stamps of the 20th century. 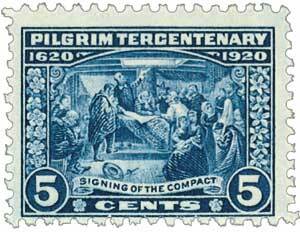 Finally, the blue five-cent “Signing of the Compact” commemorates the 41 men who, while on board the Mayflower, signed an agreement to abide by the rules of the majority “for the good of the colony.” Few realized that day the impact of their historic document. The Compact was a foundation which we now see must have influenced the Founding Fathers as they formed the United States Constitution. Free men, cherishing and preserving their freedom more than self-gain, made America a haven for “pilgrims” from many lands over many centuries. Item #570760 – Pilgrim Tercentenary Presentation Panel with album. When this set was first issued, critics complained the stamps were too small and the designs too crowded. They were also the first issues not bearing words to indicate the country of origin. Many thought they would be recalled. However, some sources say that because the story of the Pilgrims was so famous, the Post Office Department believed they wouldn’t need to include the country name. U.S. #U610 – Mayflower Silk Cachet Stamped Envelope. Christmas stamps through the decades – get 12 stamps from the 1960s to the present and save $1. 5 Responses to "This Day in History… December 21, 1920"
This was a historic event and it was very enlighting . 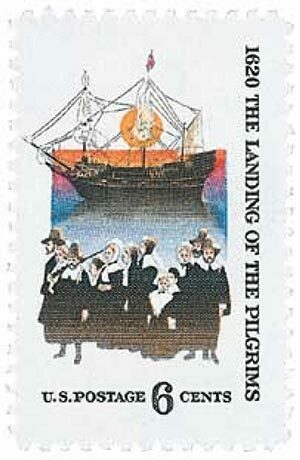 Very interesting and informative article about these stamps, the Pilgrims and the landing they honored. It’s sad that the spirit of cooperation (“for the good of the colony…”) hasn’t survived to the present. It seems that spirit was last seen during WW2.